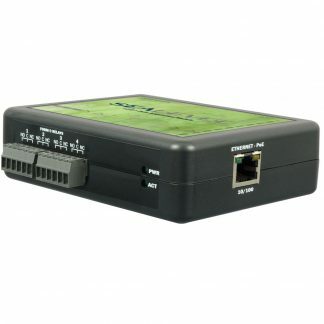 The SeaConnect 370C is an Industrial Internet of Things (IIoT) edge device that allows you to remotely monitor and control the status of real-world I/O processes. The module features a powerful, integrated event engine that is configured using an intuitive web-based interface to send alerts and trigger actions when specific conditions are met. 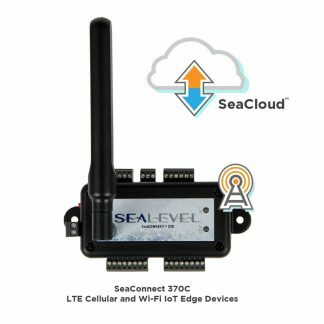 The 370C is designed to work with the Sealevel SeaCloud IIoT platform. For example, the event engine can log data to SeaCloud, which sends an alert if a measurement crosses a defined threshold. These alerts help automation engineers, technicians, production managers and network operators make informed, critical decisions. The 370C is ideal for a variety of applications, including facility management, environmental monitoring, water and wastewater treatment, as well as broadcast automation. The module integrates an LTE CAT1 single-band cellular communication chip certified for use in the United States on the Verizon network. Other cellular modules and networks are available. For maximum range and throughput, an ultra-wideband LTE sail antenna is also included. The IP67-rated, UV-resistant dipole swivel antenna provides 3dBi+ peak gain with 70% efficiency and can be rotated up to 90 degrees in both directions. The 370C features a TI SimpleLink™ CC3200 ARM Cortex-M4 microcontroller unit (MCU) with a certified Wi-Fi (802.11bgn) interface and WPA2 encryption for a secure connection to your wireless network. The module includes a variety of I/O interfaces, including two Form C relays, four digital inputs (wet or dry contact) and two 12-bit A/D converters (ADC). Each ADC can be software-configured for either 0-10 V voltage or 0-24 mA current measurement mode. There is a convenient interface for connecting 1-Wire® temperature probes. An optional QuickStart module is available for demonstration and testing purposes. The Sealevel SeaCloud service is a secure, robust, scalable, IIoT platform designed to track, monitor, analyze and control data from Sealevel I/O devices. Our Software as a Service (SaaS) cloud application works out-of-the-box and includes many IIoT features that allow immediate use without additional programming. At its heart, SeaCloud is designed as a Platform as a Service (PaaS) that can be private-labeled and modified by Sealevel to meet your specific requirements. The 370C also supports the free Dweet.io service, or it can be customized to work with your cloud platform of choice. To experience the powerful features of the SeaCloud IIoT platform on your 370C device, sign up for a SeaCloud cellular subscription and receive a free trial month of service, which includes 25MB of cellular data. You can continue your subscription for a flat rate of only $30/month or call for details on attractive volume discounts. You can purchase additional cellular data in blocks of 25MB for only $10/month. Subscription plans are month-to-month with no long-term contracts required. The 370C is powered by 5 VDC via a removable 2-pin terminal block. 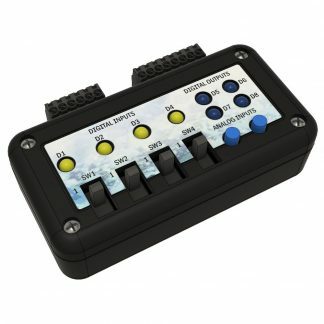 I/O connections to field wiring are simplified via removable 3.5mm terminal blocks. The module is housed in a small, rugged plastic enclosure that is ideal for mounting to a variety of surfaces or inside panels. Standard operating temperature range is -20C to +70C (-4F to +160F). LEDS on the face of the module show device status and data activity. 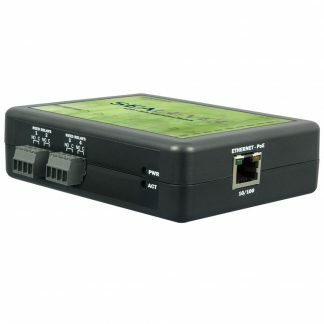 The 370C is feature and connectivity compatible with Sealevel eI/O and SeaI/O modules. Your applications that are designed for those products can be adapted to work with the 370C. Additionally, the module can be used on a Wi-Fi network without requiring connectivity to a cloud service. Communicate with the 370C module using industry standard Modbus TCP protocol or use the Sealevel SeaMAX API software libraries from your application program. Sealevel’s SeaMAX software drivers and utilities make installation and operation easy using Microsoft Windows operating systems. The Sealevel Modbus Connect app for iOS allows you to access the registers, coils and discrete I/O of your Sealevel Modbus devices and is available on the App Store. 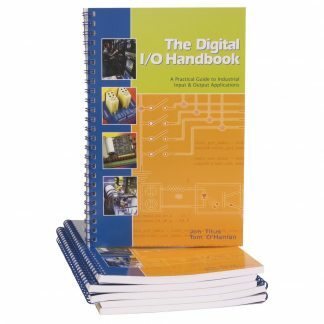 Use the app to remotely access I/O in the field or for testing and troubleshooting during application development. 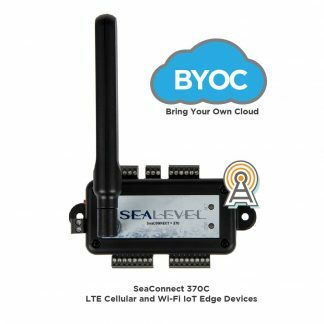 The Sealevel Mod+ Connect app is an easy-to-use diagnostic utility that allows you to monitor, test and troubleshoot Sealevel SeaConnect, eI/O and SeaI/O modules using your iPhone, iPod touch or iPad mobile device. Do you need an application-specific IIoT device and cloud solution? Sealevel can provide a number of services from design, application-specific cloud instances, cellular data plans and even billing services for a complete solution. Call us to see how Sealevel can help you realize your IIoT vision. 5 VDC @ 10 W max.